​The West End of Edinburgh, Scotland forms a large parts of the city centre. 16mm/120mm/6200mm, 4 mm hardwood top layer over birch waterproof plywood. 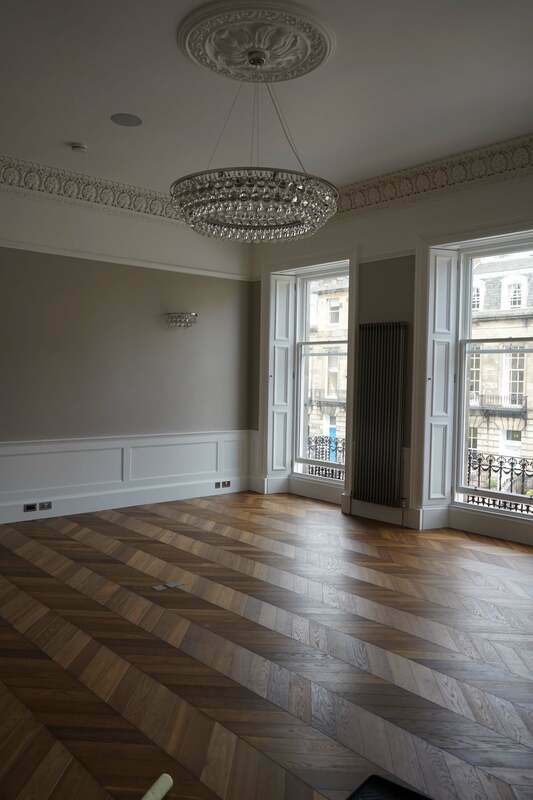 Manor Place, Edinburgh, Scotland quietly situated in a central location in the heart of Edinburgh’s prestigious West End, within easy walking distance of the retail and commercial city centre in Princes Street and George Street, and also enjoys easy access to Haymarket Station. Manor Place is a bright, spacious and truly luxurious townhouse. Internally the property has recently been completely renovated to an exacting standard using the best materials, technology and workmanship. 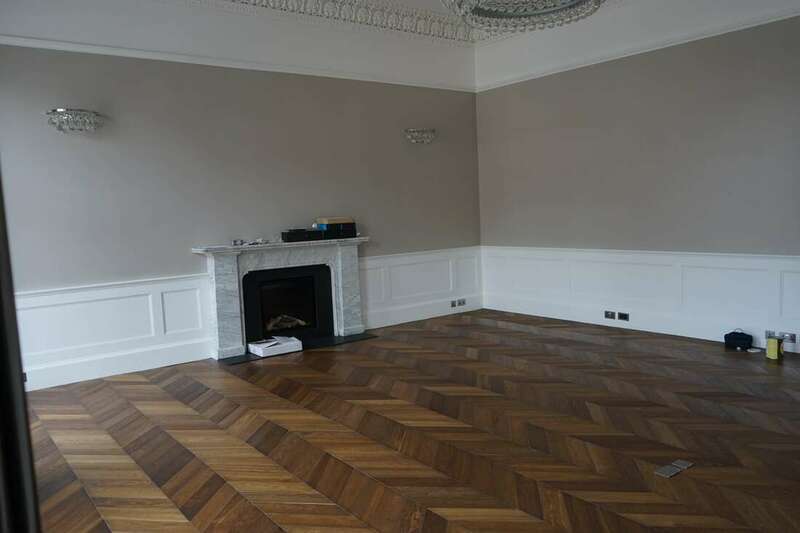 Our Engineered Wood Chevron flooring can be found in the main and largest room. The very first step before laying our chevron parquet blocks, was subfloor preparation and cleaning (subfloor 18mm plywood sheets levelled). Next step was to start the layout. When aligning and laying out a chevron parquet installation, we tend to rack out (without applying any adhesive) a row of the chevron blocks, roughly align the row to how we feel looks most symmetric to the room, straighten the row up using a laser line along each block end. Once we felt the Chevron was in a good position, and we have crown we start gluing down chevron blocks, for this project we used Bostic wood floor adhesive and nail down combination. A truly outstanding final result that our client was extremely happy with.